Communication scholars have long noted that media can influence and be influenced by public attitudes. This multidirectional relationship carries with it some assumptions , but suggests that in instances where it is not feasible to measure attitudes directly, analyzing media content can produce useful information for decision-making. 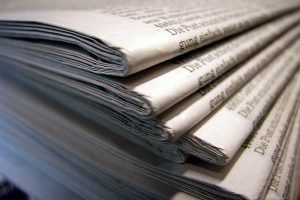 Specifically, exploring how media frames issues and risks related to those issues may help predict public perceptions. Media is often credited with perpetuating negative perceptions of and publicizing risks from sharks. 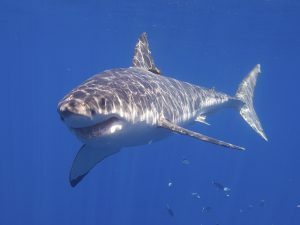 This research focus characterizes risk-related content presented in various forms of media to provide information about the human dimensions of wildlife conservation (e.g., insight into public perceptions) as well as deepen our understanding of the role of risk and risk frames in influencing human relationships with sharks, cormorants, and bears. Shark bytes: message sensation value and emotional appeals in shark diving websites. Lapinski, M. K., Neuberger, L., Gore, M. L., Muter, B. A., and B. Van Der Heide. (2013). Journal of Risk Research. DOI:10.1080/13669877.2012.737822. Australian and U. S. news media portrayal of sharks and shark conservation from 2000 to 2010. Muter, B. A., Gore, M. L., Huveneers, C., Gledhill, K., and C. Lamont. (2013). Conservation Biology 27(1), 187-196. Risk frames on shark diving websites: implications for global shark conservation. Gore, M. L., Muter, B. A. Lapinski, M. K., Neuberger, L., and B. Van Der Heide. (2011). Aquatic Conservation: Marine and Freshwater Ecosystems, 21(2): 165-172. From victim to perpetrator: evolution of risk frames related to human-cormorant conflict in the Great Lakes. Muter, B. A., Gore, M. L., and S. J. Riley. (2009). Human Dimensions of Wildlife, 14(5): 366-379.